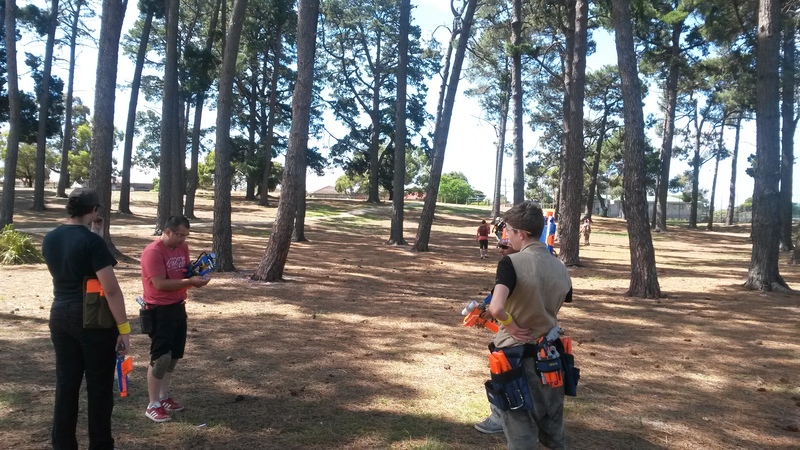 This was my first MLF event, an intermediate level group that acts as a good bridging group from the more casual MHvZ, and the more sophisticated Melbourne Nerf Wars. If a player is hit with a dart, they are downed. When downed, they can choose to wait for a medic, or go to respawn (if the gamemode has respawns). If the downed player chooses to respawn, once they move from their spot they can no longer be revived by a medic. A medic revives a downed player by placing their hand on the player, counting to 3 (at a reasonable speed). Once the countdown is complete, the downed player is revived. A grenade hit forces a player to respawn, and they cannot be revived by a medic. A melee tag also forces a player to respawn. If a melee weapon is not available, the attacking player can simply tag the target player with their hand and say that they’re hit. Kill Confirmed – very similar to Freeze Tag/Tag Teams. When a player is hit, they are downed and must wait for a teammate to revive them, which is achieved with a simple hand tag. However, the key difference is that an opposing player may tag a downed player with their hand to “confirm the kill” and eliminate them from the game. Naturally if an entire team is downed, then that team loses even if none of them are “confirmed”. The last team with surviving, non-downed players wins. VIP – one player from each team is designated as the VIP of that team (the teams do not need to tell other teams who their designated VIP is). If the VIP is downed, their team can no longer respawn (but can still be revived by their medic). The VIP must call out when they are downed, and cannot be revived by the medic. One player is designated as the medic of the team (likewise whose identity does not need to be publicly shared). The last team with surviving players wins. Capture the Flag – classic gamemode, obtain both flags at your team’s flag start to win. When hit while holding the flag, drop the flag as well as being downed. Since the rounds were very fast paced and sometimes quite short, I didn’t get to observe every blaster in action. 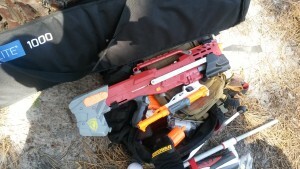 While there were some sidearms carried by players (typically Hammershots or Sweet Revenges), they didn’t see enough use to get included here. 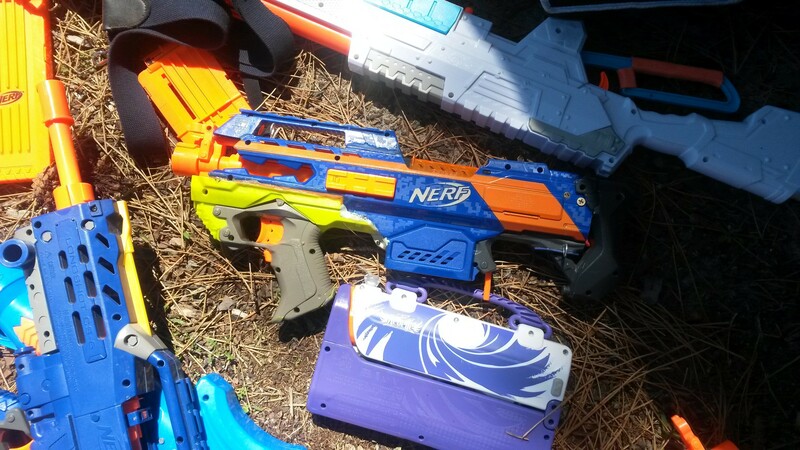 Elite Rapidstrike (various motors, LiPos) – excellent ROF made them good suppression blasters, and also effective for mowing down multiple opponents or ensuring a hit from slightly further away. All round pretty good blasters, though ammo consumption could pose a significant problem if the user was too trigger happy or carried an unusually small number of clips (mags). There were a number of Rapidstrikes seen throughout the day. 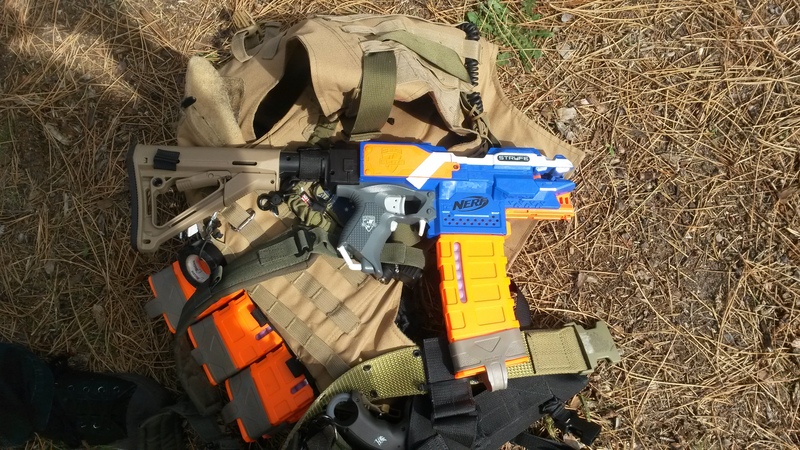 Elite Stryfe (various motors, LiPos) – pretty much more compact Rapidstrikes with a slower ROF. Slightly less effective for putting a whole lot of darts out, but easier to use and slightly harder to abuse, so ammo consumption was typically much less of a problem. 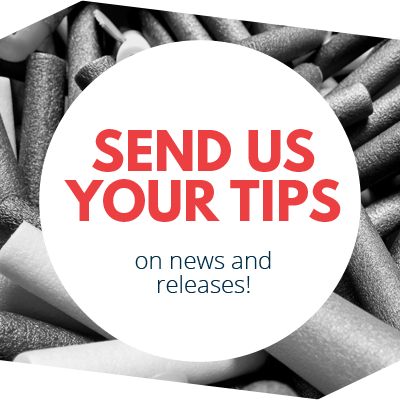 They can still put out more than enough darts to mow down opponents with practice. Also much simpler, cheaper and easier to mod than Rapidstrikes, making them a popular blaster for first time flywheel modders. There were quite a few Stryfes floating around. Elite Alpha Trooper (upgrade springs) – effective all round blasters, however compared to the significant number of flywheelers, had a slight disadvantage in ROF. Slightly less effective than Stryfes, but good use of cover typically levelled the playing field. Ammo consumption was very rarely a problem, one of my friends who used it went through whole rounds without changing clips (mags). 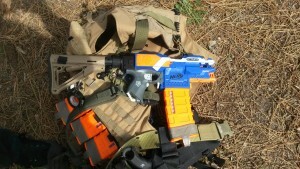 An even simpler entry level option than a Stryfe. 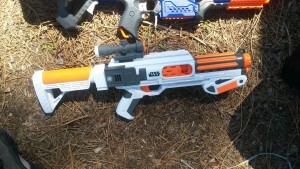 The EAT was probably the most popular non-flywheel blaster today. Stormtrooper Deluxe Blaster (upgrade spring) – performed basically like an EAT, quite good all round but not as effective as the flywheelers. I implemented a fix to the FVJ feeding problem after MHvZ, and it worked excellently today, with no issue in chambering darts. I also switched to 12 dart clips (mags) when using the Deluxe Blaster, which was a substantial improvement. 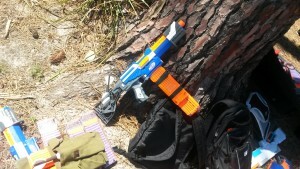 I had much better maneuverability and was able to point the blaster around much more comfortably. 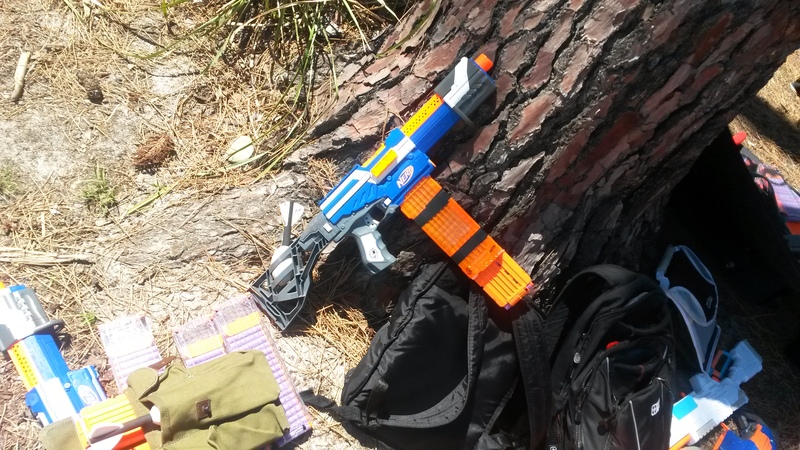 I had a lot of fun with this blaster honestly, and also had great fun charging at my friends on the enemy team while shouting “TRAITOR”. 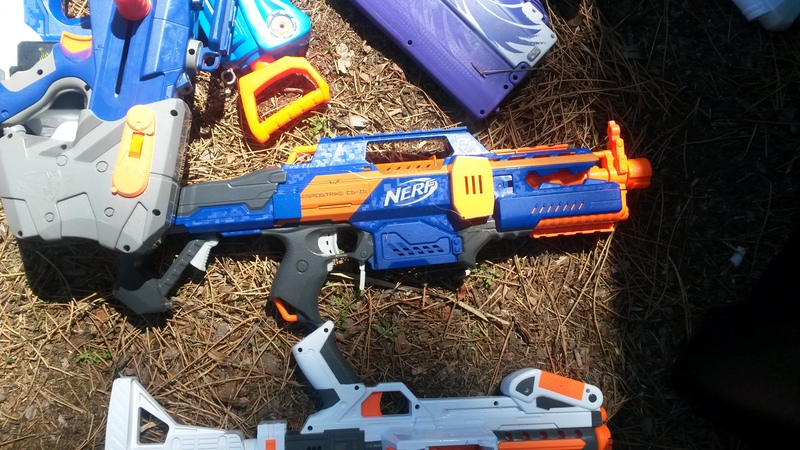 N-Strike Longshot (RemedyMetal internals, shotgun grip) – this thing had by far the longest range of all the non-air blasters, and was a challenge to approach to get within striking range. The shotgun grip greatly increased ROF, which made it that much harder to approach. Though the relatively slow ROF did present an issue against multiple opponents in close quarters, overall it was an excellent and quite dangerous blaster. 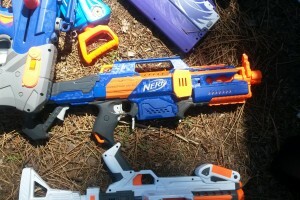 N-Strike Longstrike (unknown air tank, air compressor, unknown new breech and barrel) – the only thing remaining from a stock Longstrike was the shell. The air tank with an extremely long barrel made for an extremely long ranged blaster, while the compressor substantially sped up ROF, though was still very slow compared to every other blaster. It worked very well for long range suppression or hitting unaware opponents, but required a lot of skill and and team support to be effective. N-Strike Stampede (unknown mods) – by virtue of the event using FVJs, this Stampede was able to keep up with the flywheelers when it came to effective range. 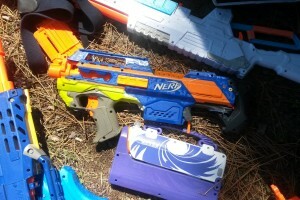 Though lacking in ROF compared to a Rapidstrike or skilled Stryfe user, it was comparable to slam-firing an EAT, which was in most cases more than enough. Overall it worked quite well, quite similar to the EATs except with a small fire delay. 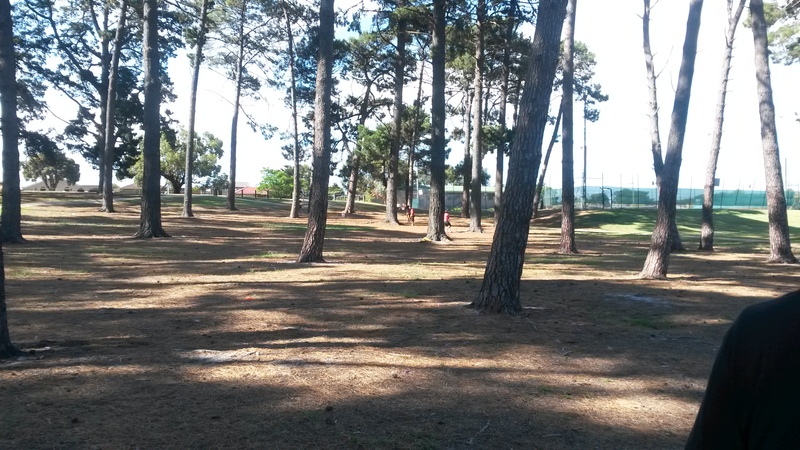 The play area we used had a lot of trees, providing a good amount of shade but also some decent cover. The shade was especially nice as today was quite a warm day, and the sun was quite harsh. One side of the area has an upwards incline to the top of a hill which is not too substantial, but very noticeable. Since the play area was based around a slope on the hill, the hill will be used to indicate positions in the play area. 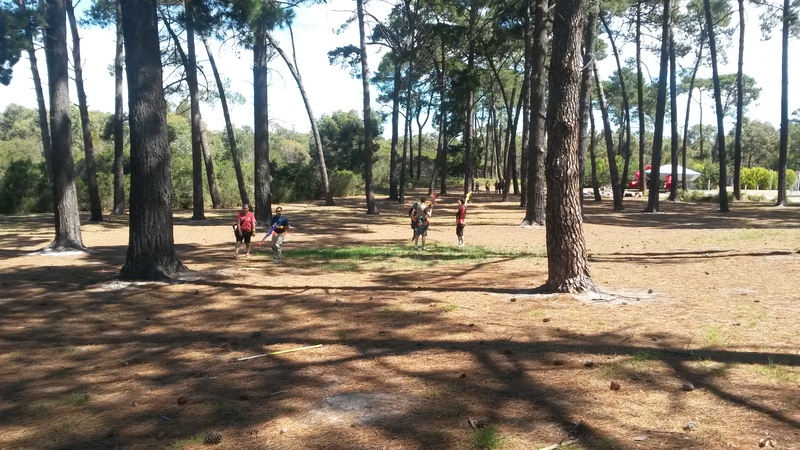 Besides the trees there was no cover, so most combat was tree to tree, and certain tree clusters were very important in terms of positioning. 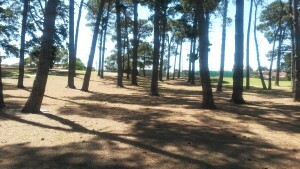 There were just enough trees to make just enough cover for the area, with the exception of one open area on one side. Player count peaked at about 12, and varied from 8 to 12 throughout the day as people came and went. In all of the spawn based games, one spawn was placed on the top corner of the hill, while the other spawn was placed in the far corner at the bottom, effectively putting them at opposite corners of a squareish/rectanglish play area. These spawns worked quite well, as it was possible to move cover-to-cover from one spawn to the other without spending too much time running. Two particular tree clusters were very important/useful in terms of position. Naturally the cluster in the centre of the area is very useful to be in control of, as it offers both good offensive and defensive position. The cluster in the far bottom corner of the area is quite dense with trees, and makes a good staging area to push towards either spawn point, or most of the flag locations. Looking from the meeting point at the bottom across the area. 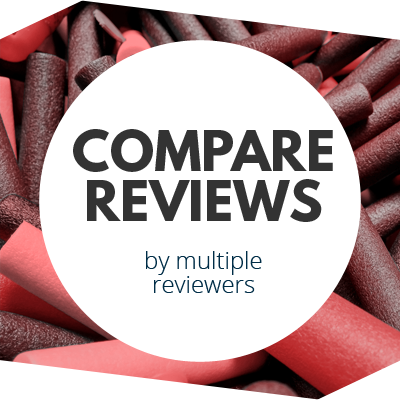 We played a number of Kill Confirmed rounds, as they require minimal setup and balancing. The only balancing required is to ensure that each team is roughly even, and that every team starts off with easy access to some cover. We played with a variety of team setups, some were 4v4, some 3v3v3, possibly more. 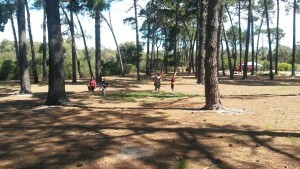 These games were usually quite chaotic and fast paced, and worked very well as basic team games. In the case of the two team games, the games usually progressed relatively evenly up until one side is able to eliminate several players in a short time. Because of the revive mechanic and everyone being able to revive, sticking in small groups worked well for survival, and greatly reduces the severity of a single player getting downed. Usually the way one team grabs an advantage is downing the most exposed player, and then the player(s) who go for the revive. The team can then push forward, utilising their new numerical advantage, allowing them to eliminate the downed players to assure numerical advantage. Since numerical advantage provides such a massive advantage in Kill Confirmed, keeping your team’s numbers up will greatly improve your chances later on. Likewise, any opportunity to eliminate opposing players is a big opportunity to guarantee a numerical advantage for your team. The game is very momentum based – the loss of one player could snowball into the entire team getting wiped out in a minute. Stopping this momentum is critical to retain any chance of victory – if your team goes two players down, you’re pretty much doomed. You have to quickly eliminate one of the opposing players to return to an even game, otherwise you’re likely to be overwhelmed by superior numbers. The 3v3v3 Kill Confirmed rounds were extremely chaotic, and the first losing team was typically decided by which unfortunate team would get caught in the crossfire. Usually this one team would get completely obliterated, and the two remaining teams would go at it as normal. All round the Kill Confirmed rounds worked relatively well. The necessity for teamwork made it far more sophisticated than a regular TDM game, and the ability to “confirm kills” gave more urgency to reviving downed players where possible. Looking down from the top of the hill. We played a couple rounds of VIP, which compared to Kill Confirmed has a much more distinct offence/defence playstyle split. Kill Confirmed is basically just regular Nerf combat with a few rules, while VIP is an objective based game. VIP involves balancing offence (trying to take out the opposing team’s VIP) and defence (protecting your own VIP). Since VIP has respawning, players defending the VIP can attack approaching opponents quite aggressively with little fear. Since the VIP behaves as a normal player until they are hit, it is usually very difficult to distinguish the VIP from ordinary players. The VIP is typically quite defensive, so eliminating them usually requires getting quite close to the enemy spawn. As such, there is usually only a short window of opportunity after successfully pushing through the enemy team to take out the enemy VIP. In all of the rounds of VIP we played, the loss of the VIP meant instant doom for their team. Without the VIP to allow for respawns, the team would have to rely on their medic to stay alive as well as reach every downed player, and if the medic is lost, the team has basically no hope. The attacking team can pretty much throw themselves recklessly on offence, as their living VIP allows them endless respawns. The only chance the VIP-less team has is now to eliminate the other VIP, leaving the teams on roughly equal footing. This however didn’t happen in any of our VIP rounds, likely due to the positioning required to eliminate the VIP. If the VIP has been taken out, then typically the attacking team will have established a good offensive position, with their own VIP well out of danger, making it very difficult to push back and get at the remaining VIP. Medics are extremely useful for offensive pushes, as they negate the need to run back to spawn. This allows the team to apply much more consistent offensive pressure. Medics can get players back into the game much more quickly than respawning, as well as in much better positions. As such, the enemy medic should also be a priority target – without the medic, the opposing team temporarily loses a substantial amount of offensive pressure, and can be fended off much more easily. Medics are somewhat less important on defence, since the spawn point is much closer than on offence, and does not require the medic running to the downed player and reviving them. Besides obvious player balancing, the only balancing required was to ensure that both spawns had sufficient and roughly equal access to nearby cover. We found two particular spawn locations that felt relatively balanced, both sides having relatively similar nearby cover. VIP is a more objective based game than Kill Confirmed, but the respawn aspect allows lone players to still perform well. Looking towards the opposite spawn from the bottom spawn. We played a number of CTF rounds as well, and they generally worked well, though there were more balancing issues than the other rounds. The problem lies in there being in placement of the flags and spawns. Both flags should have sufficient cover that they can be well defended but also effectively attacked, while the spawns should be close enough to their respective flags to defend, but not so close that players can just sit in spawn to defend. In the first round we played, the flags were far too close to their respective spawns, and as such it was nearly impossible to make an offensive push long enough and far enough to get at the flag. In this particular round, the spawns were left in far corners, while the flags were several metres in diagonally in front, so both flags and spawns were roughly all in a line. In my flag run, I was able to get around the majority of the combat, down a defender and get the flag into roughly middle ground before I was tagged. With the flag in middle ground though, it was far easier for a teammate to rush in, grab it and return it for a victory. If not for my lucky flag run, I suspect the game could have lasted much longer. While both teams had been able to take offensive positions, neither team had been able to make an effective push close enough to the flags to put them in actual danger. In the second round we played, the flags were moved such that the top one was on the top of the hill, opposite the spawn, while the bottom one was in the middle of the bottom of the hill. The problem here was that the top flag was placed at a tree where there were no trees within 20m between the flag and the enemy spawn, making it practically impossible to attack. The bottom flag was more attackable, however the bottom team was able to defend it effectively, and neither flag moved for about 15 minutes. The game lasted so long that basically every player ran out of darts in their clips (mags), and had to resort to scavenging. I even had to switch to my Sweet Revenges. 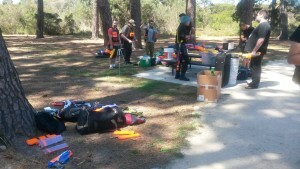 Eventually the enemy team was able to break through our ammo-less defence and take the flag. The length of the second round was unintended and the flag placement balance was poor – it is intended that players should not run out of ammo during a round unless they are extremely trigger happy and/or carry few clips (mags), and that both teams should have reasonable ability to attack the opposing flags. As such, flag placement was changed again. 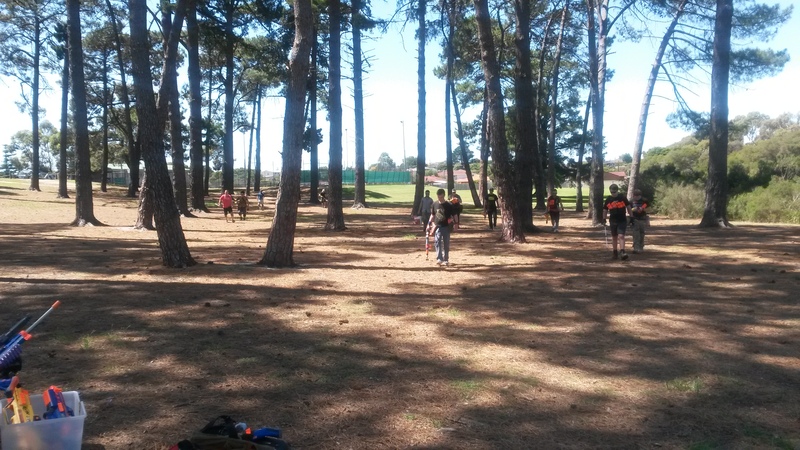 In the remaining two CTF rounds, the flags were opposite each other at roughly equal altitude, which lined up well with the tree cover and so made for the most balanced layout of all the CTF rounds. The spawns were close enough that respawning players could move to defend the flag relatively quickly, but not so close that they could defend from the spawn itself. It was possible to get from either spawn to either flag by moving cover-to-cover, which is ideal for CTF. My team won both of these CTF rounds, the first of which I fired less than 12 darts. In the first of these, my team was the one on the bottom of the hill, so I ran across the bottom towards the bottom far corner, and took cover near the enemy flag. I engaged two opponents on my own, and though I didn’t actually hit either of them, I was able to distract them long enough for two of my teammates to rush in, take out the closest defenders and run off with the flag. Since I was focusing on my two opponents, I actually didn’t see what happened until my teammates were pretty much at the enemy flag, after which I fired some suppression shots as rearguard, and we won seconds later. This round of CTF was very short, I think within 2 minutes, which was probably just through the luck of the enemy team not noticing and intercepting my teammates in time. The last round of CTF was probably the best overall one, with both sides getting close to the enemy flag, and reasonable round time. I was taken out several times, and participated in a lot of both offence and defence. Ultimately I was the one to make the flag run, taking down several defenders before taking the flag and getting clear. I accidentally took the flag towards our spawn instead of our flag, but by then the enemy team had already conceded defeat – once your flag has been taken past about midway, there’s pretty much no hope of retrieving it. In fact, in pretty much all of the rounds, every time the flag had been touched by an enemy player, it was taken all the way back and captured. Because of the relatively low speed of Nerf darts, hitting a player who’s running away is very difficult after just a second, so once your flag is out of your area, it’s almost guaranteed to be lost. Like with VIP, medics are very valuable in CTF for making flag pushes. The ability to effectively respawn in the middle of the field is very valuable when dealing with pushes, as a few seconds of numerical advantage can be enough to make for a successful flag push and run. Ironically, in my flag runs I often had no backup at all, which perhaps contributed to my successful flag runs. As a lone player, enemy players possibly took less notice of me than they did the cluster of my teammates in the middle and on defence, which perhaps allowed me to get the hits that I achieved. My speed also helped me get in and out quickly before enemy reinforcements arrived. I also used this speed at the start of most rounds to achieve a good position early on – it was this speed that allowed me to get so close to the enemy flag so early on in the third CTF round. Overall MLF was pretty good. While I would have liked to play perhaps a sillier, assymetric or more casual game to contrast with the relative competitivity of all the games we did play, the event was a lot of fun and I would certainly like to go to more, time permitting. 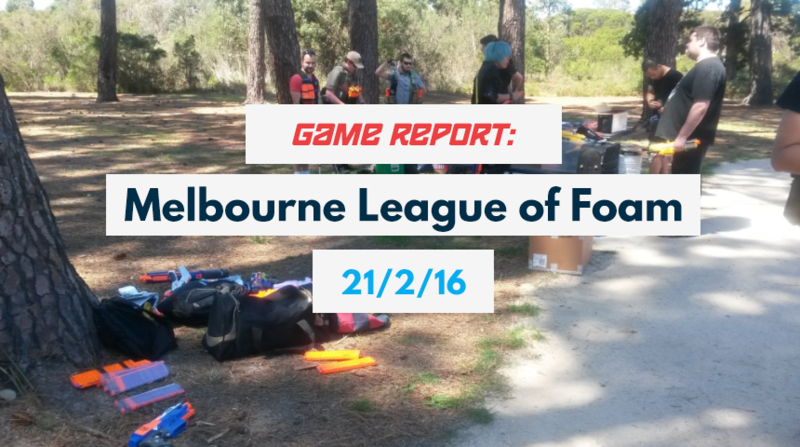 This entry was posted in Game Reports on February 22, 2016 by Outback Nerf.